Waterfowl are migratory water birds. During the summer, they breed from the interior of the province all the way to the high arctic. In fall, they undertake spectacular migrations. The lower Fraser River delta is an important staging area for many species, and some spend the entire winter. The foreshore marshes of Roberts Bank and Boundary Bay provide feeding and roosting habitat for many waterfowl species, including dabbling ducks, geese, and swans. However, marshes in the region have declined, and many waterfowl, especially those that are herbivorous, rely on farmland for finding food. On the farms, waterfowl eat vegetable crop residue, grain, winter cover crops, and forage (hay and pasture) grass. Farmers in Delta actively provide feeding habitat for waterfowl through the Winter Cover Crop Stewardship Program. 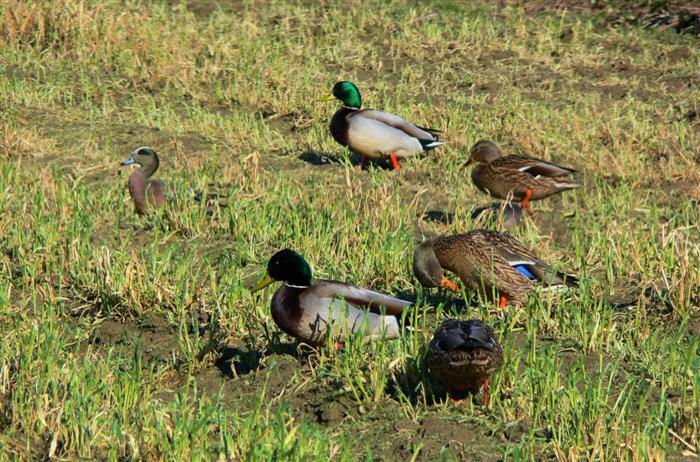 Waterfowl can be problematic for farmers; they will over-graze pasture and hay grasses. When this happens, farmers are faced with lower spring yields and sometimes the cost of reseeding over-grazed fields. The picture on this page is of several Mallards and an American Wigeon grazing on a farm field. A recent report, “Evaluation of the Economic Impacts of Waterfowl Grazing,” illustrates the economic impact waterfowl can have on Delta farms.